Writing a letter to Santa is an old childhood tradition that most people will have done when they were younger. And, if you are a young person reading this, you may want to know that Santa loves to get letters from all the girls and boys at Christmas time as it helps him to make sure that he has got all the correct presents on his sleigh and that he knows where each present has got to be delivered. Of course, whilst Santa wants to try to make sure that all the girls and boys get the presents they ask for, sometimes this isn’t always possible as his little elves cannot always get all of the presents wrapped in time for all of the children in the world. So, it is important not to expect that Santa will be able to bring you everything on your ‘wish list’, although he will always try to do his best. So, don’t make your list too long. When Should I Write My Letter to Santa? It is always good to write a letter to Santa at the beginning of December. This gives Santa and his little elves plenty of time to try to get everything ready. So, a good time is when your parents start to put up the Christmas decorations early in December. In fact, it is often a lot of fun to put on some Christmas music whilst you are writing your letter to Santa. Where Should I Send My Letter to? Just choose the name you know him by from the list above and put ‘North Pole, Lapland’ underneath on your envelope and it will reach him. Then give your letter to Santa to your Mum or Dad or even your school teacher and they will post it for you. Don’t worry if you get the address wrong though. The postman will make sure your letter gets to Santa. What Should I Include in My Letter to Santa? 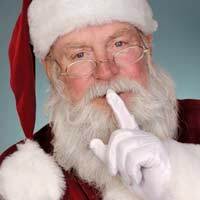 Before you start thinking about the list of presents you would like, it is polite to ask Santa how his family, his reindeers and all his little elves are keeping. You might want to ask him how he’s coping with all the work he has at this time of year. Once you have done that, tell him a bit about yourself and tell him some of the nice things you have done this year so that he knows you deserve your presents. Then, onto the good bit….your list. Don’t include too many items on your list though as he may not have enough toys to go around everybody if you have a long list. Also, make sure that you only ask for toys and presents that your Mummy and Daddy will allow you to have. And, remember to include your address! At the end of your letter to Santa, make sure you thank Santa in advance for bringing your presents as you are going to be in bed fast asleep when he brings them. Here is a good example of how to write a letter to Santa. I expect that you are very busy right now. I hope Mrs. Claus is well and that all of the reindeers and elves are happy and well too. This year, I have been a very good girl. I have worked hard at school and I am always helping my Mummy when she needs help feeding and dressing Tommy. I am getting very excited about Christmas and I hope you might be able to bring me the following toys - a Lego set, a Barbie doll, a skipping rope and some chocolate or sweets. As I will not see you on Christmas Eve as I will be in bed early, I would like to thank you now if you are able to bring these presents for me. My Mummy has told me to tell you that she will leave out some mince pies and a glass of milk at the bottom of the stairs for you and the reindeers. This website is great and fun. hello santa my little brother tony has been naughtey what do i do he has been pinching slapping kicking and being gobby to my mum hes even hert my puppy i love you santa your the best i love the presents you give me.